Archive by category "Your Brand Launch: Brand Strategy"
An edited version of this interview was first published in my column on Grit Daily on 02/19/19. I devoted my professional career to branding, from authoring books on the subject, to holding workshops and deriving brands through my consultancy, I live and breathe branding. Yet, when I sat down with serial entrepreneur Brian Scudamore, who I met when we were both mentoring at Guy Raz’s How I Built This Summit, I changed seats and had Brian share brand advice instead of myself. Brian just released the book WTF (Willing to Fail): How Failure Can Be Your Key to Success and is making a splash in the business world. And that is mainly because he knows a thing or two about how to build a brand as he has started a business in college which today brings in an average of a million dollars a day (yes, you read that correctly!) and he is on the path to becoming a billion dollar company. Brian Scudamore is a serial entrepreneur and author who has always taken the road less traveled. At just 19 years old, he pioneered the industry of professional junk removal with 1-800 GOT-JUNK, turning a chore people avoid into an exceptional customer service experience, changing the narrative of an entire industry in the process. When he ran out of new markets to expand to he scaled the business into three more home service brands under the O2E brands umbrella: WOW One Day Painting, You Move Me, and Shack Shine. In between appearances on Oprah and Dr. Phil, and on the morning where he made it onto the home page of CNN.com, little me was fortunate to score time on his schedule to talk about branding, culture, and naturally about failures in the journey of an entrepreneur. How do you get into that mindset of embracing failures? It’s so easy to say ‘fail forward,’ but most entrepreneurs are extremely driven, many have a ginormous ego and they often take failures very personally. How do you run towards failure with open arms? So I’ve learned to ask myself one question in this journey. When I am failing, when I am having a difficult moment, when I am feeling depressed, whatever is going on that seems and feels like a failure, I ask myself one powerful question: What’s one potentially awesome thing that can come from this tough situation? And I start to brainstorm and sometimes I create a big list, and I go wow, thank goodness, this is exciting! How awesome that I am failing, because look at all these amazing things that can happen as a result of this learning. I think it’s a perception. I think that people need to really, really look at why is this failure happening and trusting that you’re in the right place at the right time and that while the mistake might hurt, it is going to get you to a better place if you so choose. What was a ginormous brand fail that you went through with your venture? I think one of the biggest ones was my first big flop. I had eleven employees, and they say one bad apple spoils the whole bunch. So I end up getting rid of my entire company. I have nine bad apples, and I sat down with them, and I said guys, I gotta let you know that I think I found the wrong people. I haven’t treated you right. I haven’t given you the love and support you need to be successful, and I’m making a tough decision here, but we’re gonna part ways. So I went from a company of twelve, myself and eleven, down to one. It was just me hauling junk. It was just me answering phones and trying to rehire. But I learned a valuable lesson from that failure that your very first employee has to be amazing because that person is going to spread the culture, the vibe, and the feeling of the business and that you need to really build on finding the right people and treating them right, and it’s made a huge difference. I look at our company of over five hundred people today and how amazing for us to feel so proud about the type of culture we have. It would have never have happened if I hadn’t made some of the mistakes I did. Let’s talk about company culture a bit because I’m a firm believer that if done right, any startup should invest time and energy into creating a strong culture that can basically serve as the platform upon which everything else can be built. 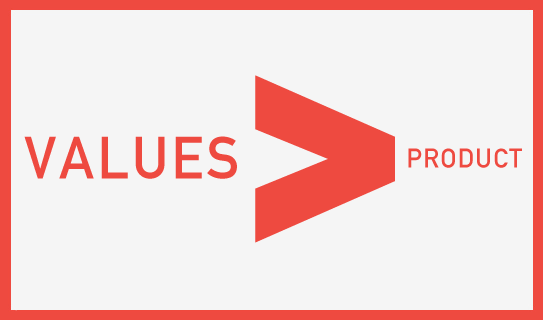 How important are core values to you? Jim Collins wrote a book called Good to Great, one of my favorite books, and he said you’ve got to have values. It doesn’t matter what they are as long as they’re your values. So we went and took a little retreat to Bone Island, a little island near our office, and I said to my team at the time, maybe fifteen years ago, I said what are our values? What words can describe who we are, not who we want to be or who we are trying to be, but who we are today? What are those words? We took Post-It notes, we put them all up on these big windows, and we grouped all four hundred Post-Its with different words into four distinct categories: Passion, Integrity, Professionalism, and Empathy. And when we looked at those words they made the acronym of PIPE. It turned into this interesting tool around ‘the junkyard,’ our head office, where we would say to people: “I don’t know if that decision was very PIPE?,” or “I don’t know if that behavior was very PIPE. It’s not in line with our values.” And so values can’t just be a poster on a wall. Values have to be something that you hold your team, your people, accountable to and you hold yourself accountable to. If you’re not displaying passion, if you’re not displaying integrity, how can you take a look at yourself in the mirror and say what do I need to change? Let me be vulnerable and admit my mistake and then let me make sure that we are living, all of us, each and every day, by our values. With building a franchise there is very tight brand management and brand stewardship involved, but equally as important is consistent brand design. What are some of the key steps that you had to go through to create a platform of tight brand rules and guidelines that also empower franchise owners a little bit, rather than solely restrict them? I sat down and I read a book called The E-Myth by Michael Gerber. Michael and I have become friends. He is eighty-two years old. He wrote my favorite book on the planet and what the book talks about is people don’t fail, systems do. Take everything in your business, and it doesn’t matter if you’re running a brand agency, or a junk removal company, take everything you do and write down on one page what’s that one best practice and how would you teach someone else to do it? So how do you load a truck, how do you answer the phone in the call center and what’s the introduction? What’s that high energy and how do you talk to the customer? How do you market the business? How do you do your accounting? Every single piece of the puzzle has to be down on one page simplified. Here are the best practices and steps. You start with the right recruiting systems to find the right people, the right training systems to make sure that they’re trained properly, and you’ve got good people doing the right stuff and then the operating systems to keep them great. If you think back to when I fired that entire team, a team with eleven people, the biggest missing system was not those people. They didn’t fail, it was me failing because I didn’t have the right recruiting systems and then I didn’t have the right training systems and so it all kind of compounded in a massive failure, but it taught me and inspired me to end up finding that book not long after to really set up the processes in my business. If you’re trying to build a franchise, franchise brands all they are is proven recipe. A recipe that you can replicate that others can follow with the same success that you’ve had. 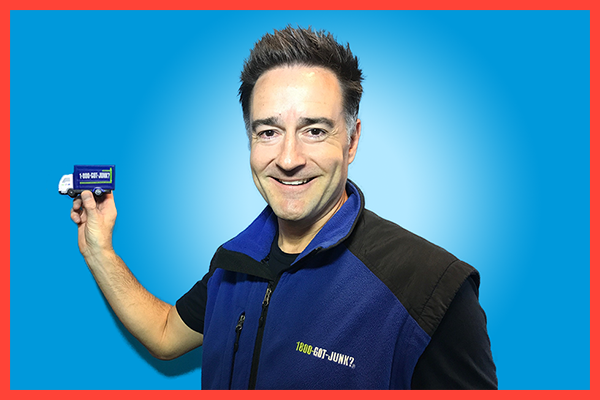 Especially with the junk business, you have to give instructions on how to change the narrative and change customer behavior to embrace the company of a franchisee as a brand rather than just another junk hauling man. How did you go about that? A lot of it was great uniforms and exceptional service, but how did you start as a brand, start talking about junk in a way where people felt like oh, 1-800-GOT-JUNK is an actual brand and not just local people who are driving around picking up my junk? I think it was just years and years of consistency of the blue and green 1-800- GOT-JUNK brand and logo. Our trucks parked as massive billboards across every city that we operate in. It was the PR. All these things that continued to happen, it was building that press engine. It was building that consistency of the brand and that people wanted to be a part of the winning story. Our success has helped, but these overnight success stories as they say, sure take a long time. This wasn’t something that just happened in a year or two years, next month will be our thirtieth anniversary as a company. You are a brand genius. You have done more than most people will ever do with one brand. What does branding mean to you? Branding to me is a look and feel, a connection. Think of a person. You look at Oprah Winfrey, the way she dresses, the personality, the energy she’s got, her intelligence, the way she can connect with human beings on humanity. She is a great brand. Businesses have to do the same thing. How do you look? How do you act? Your values, what’s the brand feel like and what makes you so special and how do you differentiate yourself from anyone else in the world? Look at brands, here in front of me I’ve got my iPhone. Some people have an Android device. Both are great, both are brands. They’re very, very different and they appeal to different people for different reasons. I think that’s the key. it is just understanding that a brand is a feeling, a look and feel and how do you strategically create it in the right way? What in your eyes is the most important part about branding that any startup should invest in getting right in the beginning? What is this one thing with your brand you have to get right in the beginning? I think the one thing is just deciding what the brand will look and feel like and stick to it. Just really be consistent. Is McDonald’s the greatest looking logo in the world? Eh, the colors don’t appeal to me, but you know what they’ve done exceptionally well? They’ve been consistent over time, they have not strayed from their brand look and feel. So, I think it’s more important just to pick something and go, you know what, we are going to be proud, we’re going to be all in and stick with it. The full article of below’s excerpt was first published on Forbes on 05/16/18. How can a brand transform into being authentic when authenticity is the very core of any brand? Last year, I wrote a book in which I studied commodity brands that people go crazy for in today’s age of innovation and disruption. It fascinated me to think that companies offering commodities — products that people don’t necessarily need more of in the marketplace, and that see no innovation in functionality or design — were flourishing. All of these companies had only two things in common that created their success: fantastic brand thinking and a truly authentic story to tell. Telling a brand’s story is key to branding and a fundamental element of any marketer’s playbook. Charles Revson, founder of Revlon, famously said, “In the factory we make cosmetics; in the store we sell hope.” Stories can change brand perception more than anything else, but they have to be authentic in order to resonate. Rewrite a brand’s story by going back to its roots. You have to feel the passion that initially formed the brand, then work your story from there. People love visionaries, problem-solvers, DIYers. They love passion and, in return, will become passionate about your brand. Lately, we have been “cause-washed” by thousands of startups jumping on the “buy one, give one” bandwagon started by the TOMS and Warby Parkers of the world. Yet there is a reason for their success. According to a survey, almost two-thirds of respondents said they actively seek out brands that support certain causes, and they’d be more likely to purchase from a brand that supports a cause they agree with. Instead of writing a big year-end donation check or blindly giving a product away for every product purchased, ensure the cause you support is fully integrated into your brand’s messaging and can only be seen as truthful. Base it on a logical proposition that creates an immediate emotional connection with your audience. Plan for it to be expandable as your service or product offering diversifies. Researching commodity brand sensations, I stumbled upon a slew where the small delights they offered were bigger than the actual product. A great example is pet supply startup Chewy, which takes delighting its customers’ love of their pets to heart. The brand sends out handwritten cards, including the customer’s pet’s name and provides a 24-hour hotline for customers to ask pet-food-related questions. How impactful can the brand trait of simple customer delight exactly be? Well, Chewy was acquired by PetSmart.com for $3.35 billion in 2017, which was a record for an e-commerce company. The core idea of consistently providing small but thoughtful delights is often the only thing setting brands apart. If you’re operating in a rather mundane segment, think about which part of your audience is not having fun, then catch them when and where they least expect it and shake them up through delightful surprises. Start with email and slowly work through your entire communication chain. 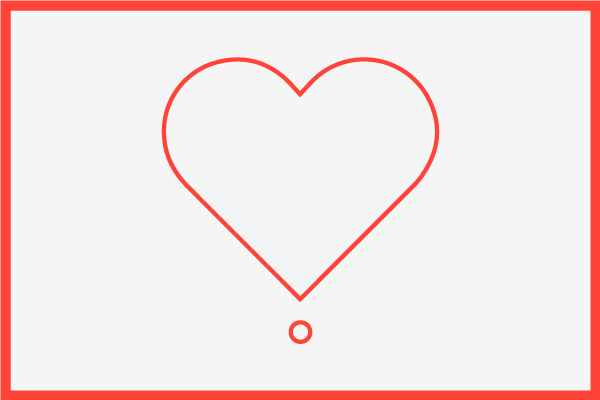 One interaction at a time will make your brand more loved. You will likely recall when Avis, which held the No. 2 spot behind market leader Hertz, famously launched its 1963 brand campaign with the tagline, “When you’re only No. 2, you try harder. Or else.” That was sheer brand transparency gold. Today’s startups enter markets and verticals that have been known for not being truthful. If your brand falls into a category that aches for transparency, comply and tell all. Customers will instantaneously trust your brand as a whole and its products over your competitors. Aligning a brand empathetically with someone else’s dream is a move I saw many startups discover. Often going after an initial niche audience, their entire messaging became aligned around their tribes’ point of view. They exclude everyone else and thrive. Planet Fitness is a poster child for leading with solidarity. “We don’t judge” is the motto, and “judgment-free zone” is the verbal brand glue that holds its 1,300-plus franchise locations together. Occasional free donuts at the fitness center entrance and tweets about sweets connect more than 6 million members that would otherwise not have easily found their tribe in a traditional gym. Perhaps it’s time for your brand to wholeheartedly support your tribe’s feelings and actions and, in turn, become one of them. Forming, not forcing, a friendship with your audience is the best way to create long-term brand love. The full article of below’s excerpt was first published on Startup Nation on 04/18/18. 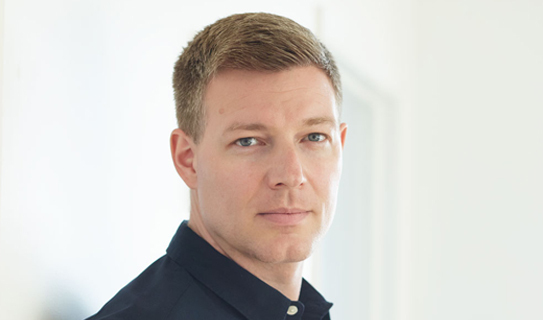 While writing my last book, I reached out to Matt Griffin, CEO of Combat Flip Flops, to answer one specific question: How did regular flip-flops turn into objects that manufacture peace through trade? While on duty in Afghanistan, Griffin, then a U.S. Army Ranger, stumbled upon an Afghan combat boot factory that also created flip-flops for soldiers for when they were taking off their boots to pray. Feeling empathy for the people he met, he immediately knew he wanted to bring those flip-flop designs home with the goal of creating jobs and funding education in war-torn countries, such as Afghanistan. There is no significant product innovation, but there is a story that is so much bigger than flip-flops: one that leads to sales. “Other than materials and details, there isn’t anything special about our product. They’re flip-flops and shoes. 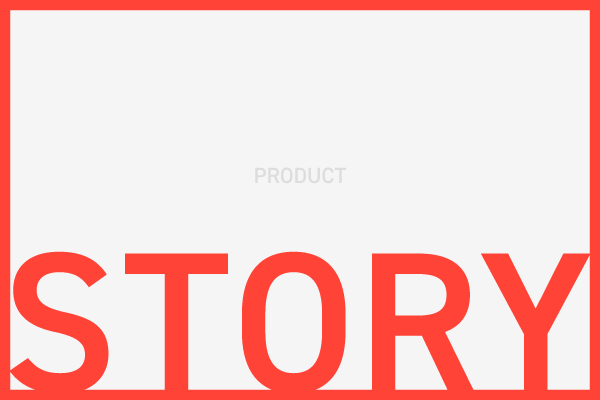 The story leads the way into our ecosystem, then the product enables more people to tell the story. The cycle goes round and round–educating little Afghan girls throughout the process,” Griffin said. The cause and his strong belief is indeed the foundation of a thriving business. If you are an entrepreneur that aches to create a cause-based brand or transform an existing brand into one that does more than sell products or services, but positively affects mankind, Matt has some advice for you. Commit fully: Question yourself. Are you willing to go all in? Give up all of your comforts and security to take on the challenge? Prepare for no funding: As much as people will agree with your “nice” idea and mission, getting them to separate with money to support you is difficult. You have to prove it with your own money before they give up theirs. Craft a story that works for your audience: For example, getting the Western Consumer to be empathetic with the challenges felt in developing nations, then inspiring them to action. Empathy is difficult these days. Don’t be discouraged, as you are dealing with a new generation of consumers willing to commit to you and your brand. Both millennials and Generation Z consumers strongly skew toward brands with a bigger mission. Given the rise of the BOGO movement (buy-one-give-one) through TOMS and Warby Parker, the path is clear for new ventures with a social cause. “TOMS will forever be known as the brand that made conscious capitalism a ‘thing.’ If they can make it work and are truly helping others, good on them. The one-for-one model works at scale and it’s tough for a lot of competition to get to that point. It’s not impossible, though,” Griffin said of such trends. As my time with Matt was running out, I wanted to know what other cause-centric brand resonated with him that we should get to know, and why? He noted saffron distributor, Rumi Spice, which was founded by a female soldier and is now the single largest employer of Afghan women. 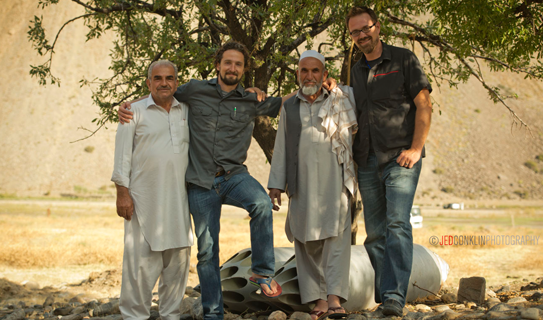 “They help Afghan farmers directly export product to the U.S. market, putting money into the hands of the farmers instead of middlemen,” Griffin said. Stories like the one of Combat Flip Flops are awe-inspiring to me as a brand builder, and they also push us to think outside of our comfort zone, and outside of the notion that only products based on tech and innovation can turn into admired brands in today’s entrepreneurial age of disruption. Below article was first published in Conscious Connection Magazine on 04/09/18. In my latest book about turning ventures into brands, Bigger Than This, I cite a stunning 116 companies over the course of only 200 pages. Some are Fortune 100 conglomerates and consumer brands like Starbucks and Uber, but most are smaller ventures that lead with empathetic stories and created swift consumer admiration. I discovered many of them during my research for the book and am now reaching out to some of those that intrigued me particularly in order to learn more from their unique ways of using their brand story as their key differentiator in the marketplace. One such venture is SAME Café. Seemingly just another small neighborhood café in Denver, Colorado, SAME Café boasts a big differentiator as it serves healthy food to anyone who pays or does not pay for the fare. More so, it attracts millionaires that dine on delicious, healthy fresh farm-to-table cuisine in a relaxed atmosphere next to someone less fortunate who are experiencing homelessness and stopped in to survive and keep on going through their rough days. Obviously, there is a lot to be learned from this intriguing venture, so I reached out to Brad Allen Reubendale, the Café’s Executive Director, to see what any business leader and marketer can learn from his unique business model that is so deeply rooted in empathy. 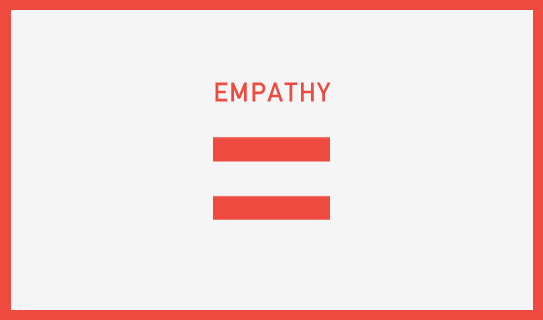 Many CEO’s and marketers throw the word empathy around just like other marketing buzzwords, but it’s time to actually listen and learn from a business that is using empathy not as a term, but as their brand’s underlying DNA. Fabian Geyrhalter: You’ve been with SAME Café for eight months. In that time, what have you learned about humanity? Brad Reubendale: You know, I’m going to be completely honest, but it’ll sound cheesy. This has restored my faith in humanity in so many ways because this organization runs on goodwill and community involvement. I come from a nonprofit background where I was in a youth-serving homelessness organization, doing fundraising for them. So much of nonprofit work is asking people for money to do the mission. This is the first one I’ve ever seen where both wealthy folks and people that have a little extra, people who have a little less, all the way down to folks experiencing homelessness, everyone has something to contribute to the community and everyone is invested in this community. So, it’s not a stretch to say that this place really has restored my faith in community and humanity. I get to see, every day, people that are maybe millionaires sitting and eating alongside people that are experiencing homelessness. I’ve just never seen another context in which that happens. Our community, our culture does not facilitate conversation and connection between various socioeconomic groups. So, yeah, I would say that’s what I’ve learned about humanity in this process. Also, when I start getting a little overwhelmed, I begin to just look at all the goodwill that is fostered through this model. This model that doesn’t approach life from a scarcity perspective, that we don’t have it and need to get more. But, instead it approaches it from an abundance perspective that says, everyone has something to give and how do we create the environment in which everybody can participate and give in? When I start to get a little overwhelmed I look around and see all this incredible love and support around me and I’m like, okay, I’ve got this. We have this as a team. No one person has to make everything happen. FG: That’s remarkable. Like you said, this only works in your microcosmos. You (as a brand) created this amazing place where a millionaire can sit next to someone experiencing homelessness and somehow, magically, they end up in the same place and somehow magically they don’t look at each other in the way that you would look from one tier of society to another. It feels like there’s common ground. There’s so much that one can learn from that. How can it be replicated in different industries and different verticals, politically? How do you think that this is possible, what makes it possible? BR: Yeah, you know I’ll go back to the founders and their story of how they got this place started. So Brad and Libby Birky founded this place over 11 years ago because they had been spending time working in food kitchens and then food pantries. They recognized that there was a gap in what they were seeing. Most of the folks that they saw there were homeless men, in extremes of homelessness, but they knew that more than just that group of people were experiencing food insecurity. So, they wanted to provide a place that had dignity built into it, where there was choice on the menu. So we made sure that we always had choice, and a place that makes everybody feel comfortable being a part of it. They wanted to have a nice, cute café feel that was openly welcoming of folks experiencing homelessness along with a business person, along with someone who has money that wants to give a little extra. I would say that the primary thing that they built into this place is a sense of belonging for people experiencing homelessness. When you go into stores where they’re serving food or coffee, a lot of times homeless people don’t feel comfortable there because they make up reasons to make them feel uncomfortable and get them to leave because the presence of poverty often makes people feel an internal sense of dissonance. It’s hard for people experiencing means to sit next to someone experiencing poverty. So, what they did, is they said, we’re going to create a place where homeless people feel comfortable and then educate the rest of people on how to interact with that, rather than saying, if it makes this rich person feel uncomfortable we’re going to make you leave. I would say that this DNA has been built through everything that we do, down to the fact that we will never put a price on anything in our entire store because we never want to make someone feel less than, because they can’t afford that thing. Everything in here is ‘pay what you can’ or participate in exchange for it. So, we believe in fair exchange, both for your budget and for our budget. Basically by always keeping an eye on the least common denominator, if that makes sense, or the person who is most marginalized, we can create a community and then educate those who are not marginalized around how to interact with that. That’s, I think, the secret sauce that’s in place. We’re more concerned about making sure that someone experiencing homelessness feels comfortable and educating the wealthy, rather than making the wealthy feel comfortable and inviting the homeless into that. FG: That’s fascinating. Usually, you have target audiences, right, you say well, I’ve got Blue Bottle Coffee and I’m going to have millennials that spent their money on our coffee and I want it to be exclusive. I want it to be something a rather singular, very specific audience connects with. You invite homeless in first and that’s going to be our target audience. But how do you get the wealthy into a place that is, in the beginning, known to serve the homeless? It must be difficult to talk to them and get them in, or is it totally not difficult and people were waiting for a chance to very easily give back and to become part of that? BR: That’s a very good question. I thought in terms of: How do we make sure that someone with means can feel comfortable in here too? How do we remove the tension as much as possible? So, we’ve done a couple of things: One is, they did a little update on the café. It just needed a fresh coat of paint and that kind of thing. So, it feels like a little bistro that you want to sit in. We have an amazing chef who does miracles with vegetables. So, anybody would want to eat it. We also are farm to table. So, almost 100, well I’d say about 90% of our vegetables come directly from gardens and farms here in the city, that love what we do and give us their extra produce. It really is farm to table. We’re able to get donations of produce that there would be no way we could ever afford to buy. Because we’re fostered on goodwill we’re able to have this incredible food that we could never afford to purchase if we were just a business, but because we’re fostering goodwill they donate it to us. We’re able to turn it into this amazing food. Anybody would be lucky to eat here, not just like, let’s give the homeless our leftovers. How do we create a meal that everyone would love to eat and then allow homeless people to feel comfortable in that? Because we have no prices, it can have some internal tension for people when they come in and say, I have a 10 dollar bill here, is that good, is that bad, is that more than you need, is that less than you need? So, we created a chalkboard that actually has what I call a transparent budget. We have this is how much it costs per plate of food and it’s a little under $2. This is our average donation, which is a little under $5. This is how much it costs us to deliver the entire meal, which is a little under $12. So, we have the actual numbers in there. I try to update them at least annually, is what my goal is, but I make sure I’m doing it every month. In that way, everyone who walks in says, there are no prices, however, I can look at this and get an idea of what I want to come in and give at this rate. So, then it says if someone wants to drop a twenty and they know that 12 of that covers my meal and then 8 of it goes to help somebody else. If someone’s experiencing homelessness they can say, oh I want to at least cover this $2 that will cover the cost of food for me. If I can’t do that I want to participate by means of volunteering. So, it’s basically made everybody feel a little bit more comfortable and at ease because of the lack of prices. Our goal with that is to try to get people away from the idea of money as the only way to exchange for something, but instead get more into the idea of, what do I have to offer this community that will benefit while I have the benefit of food. FG: Amazing thought process. You talked about the homeless that do not have the $2, right? They feel like, okay, because I don’t have the money I need to give back. What are the ways that they can give back? Is it by washing dishes in the literal sense? How far do you integrate homeless into SAME café? Do they actually have the chance, at some point, to work their way up and become full time hired or how does it work? BR: That’s a great question too. So we have opportunities to do any volunteering. That includes literally washing dishes or literally cutting vegetables and prepping food. Because we are a functional kitchen we just have to make sure they have closed-toe shoes and they’re wearing sleeves or you know, those kinds of guidelines. As long as they fit in that then they’re welcome to the kitchen. They’re learning food skills. They’re learning dishes. They’re learning this stuff. We’ve actually seen many folks who come in volunteer in exchange for a meal while their homeless, get jobs in restaurants because they use us as a reference afterward. So, they’ll say, you know, SAME Café knows my work ethic and they will be a reference and then they’ll get employed because they have experience in the kitchen volunteering with us. So, that’s the kitchen side. If they can’t or aren’t comfortable being in the kitchen or they don’t have the ability to, because they’re not wearing the right clothing or whatever, then we offer options in the Café part. They can buss tables. They can wipe down tables. They can clean the windows, water our plants, prune the plants because we have a lot of greenery in here as well. So, there’s always something that someone can do. We just make sure we keep open those options for people that want to exchange time for a meal. We want to value that just as much as we do someone who’s giving us $50 for their meal because they love what we do so much. FG: When people volunteer … I know SAME is all about trust, right? Obviously, it’s built on trust. Even with the vendors, I love the story that you’re shooting for organic produce, but you don’t make them be certified organic because it’s very expensive, difficult to obtain and you don’t want to have them go through that formality. Instead, they just sign a piece of paper every morning saying, yes, we just picked the produce. It is from our land and our land is adjacent, local. So, there’s trust, but yet they sign something. I’m sure that the system works with the volunteering in a way too? You might not clock their time, or maybe you do – how does it work? I know you’ve got certain hours too, right? I think you’ve got hours before opening where volunteers come in. BR: Yeah, correct. We have three, four different options for volunteer shifts, if you want to pre-sign up. Our pre-sign up volunteers are typically people who are giving out of their abundance, not because of the exchange of a meal. But, for the drop-in volunteers we ask for at least 30 minutes of their time, if they’re going to pay for a meal through working. The idea behind that is, we wanted to make it fairly equivalent to if they were getting paid minimum wage; that’s roughly the amount that they would get for a half an hour of time for the meal. So, with that, we have two staff in the kitchen at any given time. There’s only three staff that work here, myself, a full-time chef and then we have a part-time volunteer coordinator. So, basically, they’re working with one of the staff members to get an assignment and then check off. They sign in and then sign out whenever they’re done. So, it is based on trust, but they are also signing in and signing out whenever they’re done with their task. The interesting thing about it is the wealthy. For instance, we have a volunteer who’s quite wealthy, who volunteers here every week when she’s in town, when she’s not globetrotting. But, she found out that we needed a refrigerator, that was going to cost us several thousand dollars. We were going to get a refurbished one. She basically said, no don’t get refurbished, that never works, and she bought us a refrigerator out of her abundance and gave it to us and that was $3,000. In the same week, and I love that this happened in the same week, we have a young man who I know is experiencing homelessness, because he lives really close to where we are and I’ve seen him out there, who was supposed to sign up for a 30-minute shift. At the end of his shift he wasn’t finished with his task, which was cleaning our windows, so he stayed an extra 15 minutes just to finish his task, because he’s invested in this community. He didn’t need to get a meal. He just wanted to complete it and make sure it was perfect. He was giving up his abundance, which was time and she was giving out of her abundance, which was money, but both of them were so invested in this organization and in this community that they gave out of what they could. Both of them went above and beyond what was ever expected. FG: That’s just magnificent. Let’s talk about the ‘pay what you want’ or ‘pay what you think is fair’ strategy. Do you see the model being successfully applied in any other business verticals, because I’ve only seen it applied in music and restaurants, but I’ve never seen it applied to anything else at grand scale, have you? BR: I’ve been so absorbed in this model for so long that I haven’t looked outside of it yet. I think the mentality can be there without necessarily doing a completely pay what you can. It really is based on trust of human nature and allowing people to give, because they love what you’re doing, not necessarily out of, this is how much it costs, if that makes sense? FG: Yeah, that makes sense. BR: I think that mentality could definitely have different reiterations that are not just the pay what you can model. I know one of the benefits of being structured as a nonprofit is that we don’t have to worry about covering our entire cost through sales. In fact, if we ever did, we’d lose our nonprofit status, because the government’s going to say, you’re a business, you’re not a nonprofit. So, we get to bolster that through fundraising efforts and through grant writing and various things, which actually helps us, because then we’re not necessarily worried about how much we’re getting into the door. We’re looking at it to make sure that we’re meeting our goals and all that, but we’re not necessarily concerned about meeting our total budget through sales alone. I’ve also found that there are things that we can do outside of the café in terms of marketing, that we would never do inside the café. For instance, we have these little tokens that are wooden. They have our logo and it says, one free meal at SAME Café, and our address and phone number and all that. So, there are these wooden tokens, and then outside of the café I will tell people I have meetings with, or if I’m speaking to a group, will you please cover the total cost of providing a meal, which is $12 for each of these tokens? They carry them around in their pocket and hand them out when they see someone experiencing homelessness or poverty. That’s something we would never put a price on in the café, but when I’m outside the café or outside of business hours I can talk about that in a more open way and say, here, you can do two good deeds with one act. You can help cover our total meal cost, and you can then go give this to someone experiencing homelessness. I know some people have their little cognitive dissonance as they give cash on the street. Some people don’t like to do it. I’m one of those people. I’ve worked in homelessness long enough to know that it’s better to give to an organization that’s doing good rather than a person because then you can understand the impact that it’s making. But, what I love about that is that it gives me the chance to do this marketing in other stages that I couldn’t do in the actual café, if that makes sense? FG: Yeah, totally, and there’s a story that you can then spread via social media, which I know you do, which is great. Really what it is, it’s a viral campaign. By you giving people this actual piece in their hands, that then they feel like they’re walking around and constantly they think about the café, because they constantly know that they have it in their pockets and then they spread the word of the café to your second target audience while you have the first target audience engaged. It really is a viral campaign, which is amazing. BR: I love it because it’s socializing people with means to see homelessness too. That’s a big thing, because often homelessness is invisible to people. If you’re carrying something that you’re wanting to give away suddenly you’re noticing people on the streets. That’s kind of a side effect of it. It’s not what I advertised it as, but it’s having that effect for people. So, they’re seeing people on the streets more than they would if they didn’t have this in their pockets. FG: Well, because they kind of have to seek them out in a way, where usually people avoid looking at them. You bridge that. BR: There was a marketing campaign that I saw. I forgot what city it was in, but it was for a homelessness organization. There was a sign on the side of the building, way down low, it was stuck to the side of the building and to the sidewalk, so it was kind of like seeded there. The sign said: ‘If I was a homeless youth you probably wouldn’t see me,” and then it had their information, because they were sitting like a kid would sit on the street. It was so powerful, because it’s true. We notice the sign, because that’s out of the ordinary, but we ignore people, humans, who are sitting there, because we’re not socialized to see that. We actually ignore it. We’re countering that by having people carry around something that will make them see homelessness as well. FG: That’s really powerful. In my book I talk about how even big brands started to talk about politics lately, obviously Brexit, Trump, the NRA, there are just plenty of reasons why brands suddenly have to take a stance, which usually for brands politics is a taboo. Is SAME Café ever making political statements? It seems like you know your audience well and it’s definitely more on the liberal side, one would assume, as far as their social point of views go. Do you stay away from mixing food with politics or do you actually go down that route too? BR: That’s a great question too, because we very, very intentionally have zero stance on politics and zero stance on religion. Specifically for a couple of reasons. One is, you’d be surprised that our base is actually quite broad politically because we’re not a handout and that makes it appealing to more conservative people. Everyone’s participating in exchange for this, and it’s food. So, food is a non-political thing. Every human in the world has to eat food. So, we stay away from any of that. We get to appeal to a broad perspective. We get to be a place where folks can come together, because nobody believes someone should starve to death, like literally no one if there’s an option for getting food through work or through some other means, you know? So, we actually appeal to a broad religious base and a really broad political base. We will never, ever have a comment about politics or religion. It’s really fascinating on both the political spectrum and the religious spectrum. I’ll speak about both, because we have such a broad base. On the political spectrum the people who love what we do, who are on the conservative side, they speak about how it’s not a handout and that people can work in exchange for their meal. On the liberal side, people say, I love that you’re able to provide options for everybody regardless of their socioeconomic background. So, they find value in it, but it’s not necessarily the same thing that they’re valuing. On the religious spectrum, it’s fascinating, because we will have churches who support us. They say that they love that we’re doing the work of Jesus because you’re feeding the poor. We have Jewish groups that support us because we’re doing the Mitzvah. We have atheist groups that say, I love that you’re humanitarian and not religious-affiliated. So, we see that spectrum as well. Everyone is able to find their own values in what we’re doing because it’s so common to our humanity to eat that it doesn’t necessarily have to be religious or political. FG: It’s amazing and sad at the same time, because finally someone cracked the code to have people from all ages, all races, all political and religious backgrounds in one place yet they can’t talk about the big topics. After listening to this, you’re doing so much good in so many ways, why don’t you franchise? Why don’t you say, well, let’s go from city to city and create this and start an actual movement? BR: Well, SAME Café has started a movement. There are over 50 cafes that have been inspired by this one out there now. They’re under the umbrella of One World Everybody Eats, is the name of the organization, which was the name of the original café that inspired Brad and Libby to start this one. In large part, I think the reason that all of them don’t have the SAME café branding is just because Brad and Libby were so focused on the community that we’re in. We have an open-book policy. Anybody that wants can come and volunteer here for a week, see all of our books and go replicate it, however, they want to. It’s kind of more along the lines of an open source idea rather than a franchise idea. That being said, I’m also interested in developing a franchise-type model where we can provide a little extra support for those who need it. We can give them the document that we’re using. We can give them the branding that we’re using and then they don’t have to come up with it on their own. That way we can do a little bit more oversight and do a little bit more of training and sharing of the expertise that we’ve learned here over the last 11 years with other people, so that is on the horizon. It’s something I’m very interested in doing. The other reason I’m very interested in that is, with this model it can go off the rails in two different ways. One is, it can become a place where wealthy people just feel good about spending money and it’s not actually achieving the social good that we’re looking for and poor people don’t come in. The other way is that it can just become a soup kitchen and then only homeless people come and people give to it, because they love what it represents, but never want to eat there. FG: Hence the franchise model, because franchises, as you know, they have very strict ways of how it’s done in order for it to become a replica of the other one. BR: Precisely. So, that’s been my mentality. I’m a fundraiser and a marketer, which is basically the same skill set, that markets and fund raises, so I feel you with that. I have a similar mindset. So, what I’ve been looking at, since I’ve been here, is how do we codify the secret sauce that makes this place great? Because we have been very successful in keeping that balance between being a soup kitchen and being a place where wealthy people just feel good. There are others out there that do it well as well. But, I would love to be able to codify some of the things that make us successful and making sure that we’re passing that along so that it’s getting replicated more closely to our model. One of the things I’m going to do hopefully in the next few years is to start a second site, so we can try it out in a different place, in Denver, and then we can use that information to start a franchise model that has more of the secret sauce that says, this is what makes it special and unique. FG: That’s really great. Then there could be the app, right? People would find, wherever they traveled, they find, oh yeah, here’s one of those in Los Angeles and that’s great because I have an extra two hours, so I can take an Uber there or drive there, and actually support what I believe in. That being said, I actually have two more questions. You have a lot on your plate, no pun intended. There’s a lot coming up and there’s always enough to be done. Do you seek people from my community, and may it be the marketing community or may it be the business community, who could potentially volunteer and help you guys with something? BR: Definitely, yes, if someone has something that they think would benefit SAME Café I would absolutely love to talk with them about how we can incorporate that into what we’re doing, because I do want to grow. The other thing is, through volunteering, they can always come and volunteer here, either in exchange for a meal or they can sign up for the pre-scheduled volunteer shifts. I’m also very interested if somebody wants to sit down and look at the franchise model and how do we make sure this gets replicated well. Basically, if someone thinks they can help, call me, I’d love to talk to them. FG: The last question, this is an entrepreneurial question, since I looked at your LinkedIn and I feel like there’s a lot of entrepreneurial spirit in what you do. Even though you’re the Executive Director at SAME Café, if you would ever, either have to or you would ever choose to, start a business on your own, what would it be, and you might not know it off the top of your head, but how would the ideology of SAME Café have formed your new venture? What would certain aspects be that if you would start something on your own you would take with you into that new venture – any learnings, traits or commandments that you have within your organization? What would you take with you? BR: Absolutely. There’s a couple of them. The first one is, always have a social mission. If you’re going to start a business have a social mission too, because that fosters so much goodwill. Make sure that you’re achieving that social mission, it’s not just a stamp that says, yeah, we also give to this or whatever, but actually get invested in some good in addition to making money. Because, first of all it’s just good business. In the current climate and as millennials become more spenders they also want to see what good they’re doing with it. They’ll pay extra to see that good is happening with the organization that they’re supporting. The other thing is, always keep an eye on the small person. Always keep an eye on the person that you think doesn’t have anything to offer, because they always do. I have on my desk, it’s the only thing on my desk actually that’s permanently there, is a framed little piece of art that was made for me when I was working with kids in an elementary school. I gave them all scissors and some paper and crayons and I said, go play and do your thing. But, there was a girl in there that I totally discounted. She had some mental incapacity. She wasn’t very fast. I was like, she’s not going to be able to create anything. She brought back this piece of art that struck me. It was multilayered. It was beautiful. It had a right color combination. I was like, she just shocked me because she brought something that was beautiful and I expected zero from her. I decided, that was when I was 18 years old, I’m going to keep this for the rest of my life wherever I’m working so that I remember to look at the person who could surprise me. Remember to see that person who’s invisible to others and see what I can foster in them to be able to create something beautiful. So, I say, keep on that person that you don’t think has anything to offer, because I guarantee you they do. FG: That’s an amazing story. I mean, that’s an amazing story for human resources, for hiring people and for looking at people in a different way. It’s beautiful. This was really, really inspiring. This is great. BR: Well, thank you so much for taking the time. I’ve thoroughly enjoyed it. I love talking about this. Obviously, I think that comes through. This interview was conducted in January 2018 and excerpts were first published on CEOWORLD Magazine. If you want to contribute to SAME Café’s success, you can connect with Brad via LinkedIn. Yesterday marked the release of my new book, ‘BIGGER THAN this – How to turn any venture into an admired brand’ and I was fortunate enough to have Thrive publish an interview with me coinciding with the book release. The article turned into a very personal Q and A. Most likely because the interview was conducted while I was vacationing up in the serene Austrian mountains, it turned out so very sincere. I just spent an hour at Amazon. Not on Amazon, at Amazon. As an author with a second book release upon me, I study book marketing up close hence I just had to make a pilgrimage to Los Angeles’ first physical Amazon bookstore. It opened two weeks ago as part of the Westfield Century City Mall‘s universally talked about staggering 1$ Billion re-model (…and we thought retail was dead). I was doubtful when I initially heard about Amazon going into physical storefronts thereby going back to the business model they once so successfully disrupted many years ago. Well, my doubt was quickly turned into exhilaration as Amazon did not simply open a storefront, they changed the way consumers experience products offline – with a whole lot of help from online insights. Amazon successfully and holistically transformed what worked online into a physical brand experience. It took full advantage of its massive amounts of data, to my delight. 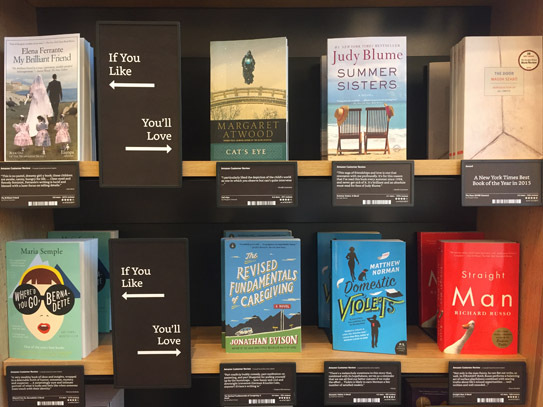 At the AmazonBooks store, you are greeted with shelves titled ‘Highly Rated – 4.8 Stars & Above’ or ‘100 Books to Read in a Lifetime – Our Picks from the Amazon.com List.’ Not surprisingly, it works and it pulls you into a curated, and more importantly, customer-verified, experience. Do you trust that Maggie from the local bookstore has a ‘Staff Pick’ or do you trust hundreds, thousands, millions of readers just like yourself? Sorry, Maggie, I am all up for supporting local stores, but that was an easy pick. Not so quick though, as Amazon knows it needs to, and should, make the experience a local one. ‘Read Local – Notable and Highly Rated Los Angeles Books’ as well as top-rated books from readers in L.A. are showcased prominently. Another nice touch is Amazon’s integration with the online reader community of Goodreads, albeit logical as Amazon acquired the site in 2013. Still, seeing ‘Goodreads Most-Read Classics’ and ‘Book Club Picks from Goodreads’ adds more intrigue to the books stacked in traditional bookstore style underneath. Each of these components engages, builds trust, and keeps you in the store longer. But let’s not paint a picture of Amazon showcasing only the proven books, by the biggest authors, on their rather limited shelf-space. You’ll see books of unknown authors, some that are rated only a few times, next to the big sellers. 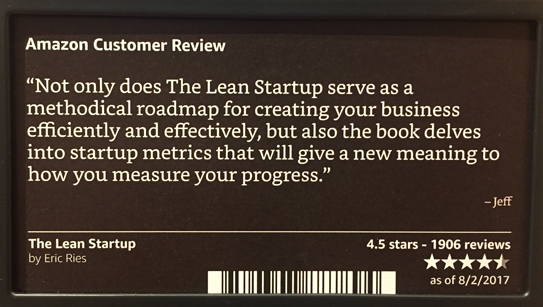 One book particularly stood out (Innovating by Luis Perez-Breva and Nick Fuhrer) as Amazon’s description reads ‘100% of reviewers rated this item 5 stars.’ The book only had 21 reviews in total. This makes me feel like I am discovering something, which is one of the key ingredients of a great book store. Amazon also picks customer reviews to showcase, rather than the author’s book description, or an Amazon editorial review, which makes the experience even more personable. The last store curation effort that made my heart speed up was the huge shelf-space dedicated to ‘If you like this, you’ll love these.’ A key component of the Amazon.com shopping experience, seeing a book you liked on a shelf with six you never heard of next to them, suggesting that you’ll love them is a sure-fire win in any customer browsing experience. Besides taking away that Amazon has nailed its data integration into its retail environment – not to anyone’s surprise – what can you, as a CMO of a brand or as a startup entrepreneur learn and immediately utilize from its success? Map your online customer brand experience, then take it offline. It feels upside down, and precisely that is Amazon’s amazing ‘Zag’ in this instance. How do users behave on your site, what content do they read, what call-to-actions do they skip, which offerings do they spend the most time on, and so on and so forth. Study it. It’s there, you just have to start digging into it. Then take that data and make use of it in all the ways you conduct business offline. As many of you don’t have retail stores that you can start experimenting with, you may think this is not applicable to your brand. 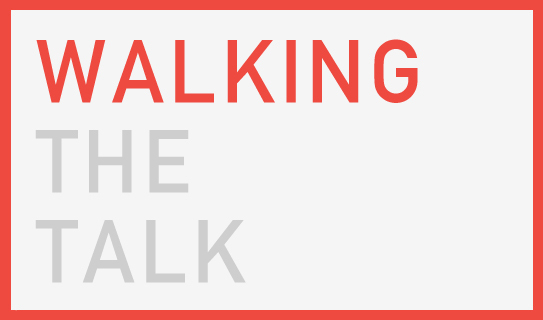 Think again: sales presentations, prospect case study conversations, tradeshow experience designs, new product launch considerations, brand initiative ideas, brand narrative adjustments – you name it. That online journey can be a game-changer in the way you engage with your customer/consumer/member everywhere else. Much has been said about leveraging latent data and creating actionable new data points for brands of all sizes to utilize, but the essence of what Amazon did is actually rather simple at heart: Study the trail your online users leave behind and use it to educate a new or revised, deeply educated and highly personalized offline brand experience. What we learn from AmazonBooks is that these insights can even be used to craft a brand narrative for a new brand extension: Translating what works naturally online (‘if you like this – you may like that‘ as an example) for their brand and making it work as a novelty in an offline experience that is 100% true to Amazon’s brand essence. It’s not just connecting data for increased sales, it is doing so in a way that is intrinsically true to the core brand philosophy. 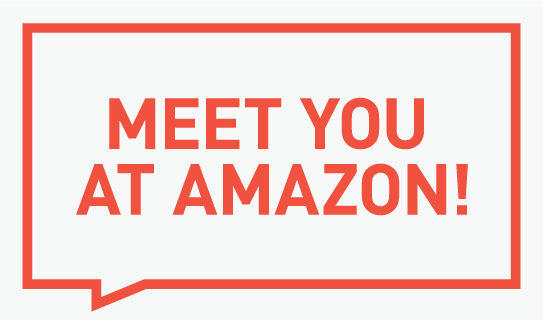 Amazon’s user journeys helped create an offline sub-brand. It may be time to look at your brand’s online data, create your user journeys and translate them into successful offline experiences. It will re-affirm, or re-educate your brand’s essence, or perhaps it will even inspire you to launch a new brand extension. Until then, you can find me at Amazon as on Amazon is just too one-dimensional and old-fashioned. I entered a contest. Not a design competition, but a simple consumer contest. They got me with the squirrel. I went nuts not to find that silly acorn, well that too, but over the genius, or the team of geniuses, who were briefed to get people to click-through their Fall Collection of indie food products. Instead of a beautiful collage of their products, or by cramming in as many different products as they can, they created a ‘fallen acorns scavenger hunt’ thereby ensuring people had to click through a lot of their new products thereby familiarizing themselves with a variety of offerings not unlike they would scrolling through an Instagram feed. If you can get the E-Mail recipient who is the least-likely to partake in a contest, even less likely to engage in reviewing products he is not interested in purchasing at the time (but will likely recall once the holidays are rolling around) to click through your E-Mail and participate in your brand in the middle of a workday, you clearly did something very right. Back in July, the San Francisco Museum of Modern Art (SFMOMA) launched their way of successfully distracting people from their work by asking them to text them an emoji. 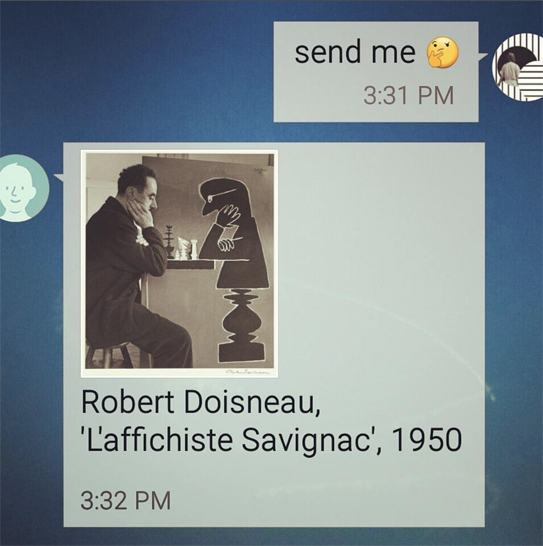 The service sends a related art piece of their vast collection in return of you texting ‘send me [insert any emoji, keyword or color of choice]’ to their number (572-51, if you are curious). Here was my wife’s interaction at the time. I immediately tried it myself. You are not alone. In one single week they received – hold your breath – 2 million texts of people hungry to see art that was relevant to their current mood or personal interest. For the museum, it was an answer to the question ‘How do we get people to see all the art (95% of the collection) we simply can not show on the floors of our museum?’ What they got in return was so much more than interest in art. They created brand awareness, and brand love, (and collected millions of phone numbers) via a simple idea and an auto-reply powered by good data. 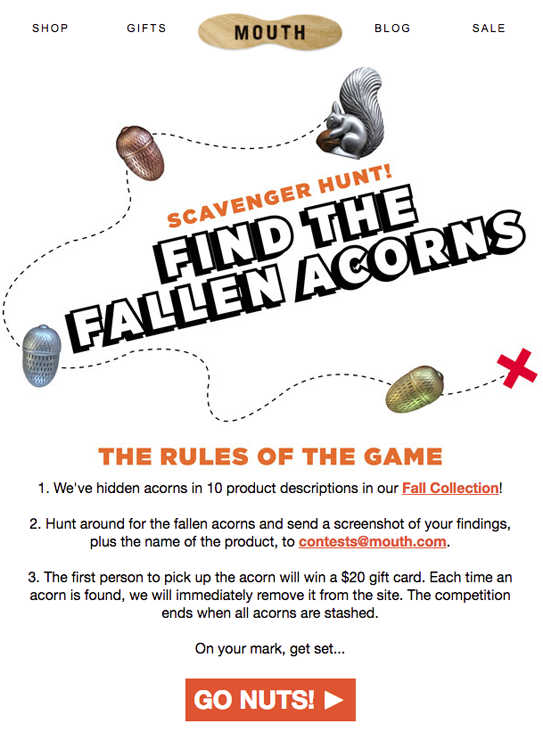 It’s time for us to gamify our brand experiences, especially the ones that are being sent via E-Mail to thousands of opted-in customers like it was the case in MOUTH’s acorn hunt example. E-mail has a median return on investment (ROI) of 122% – more than four times higher than other marketing formats, including social media, direct mail, and paid search. Combine that with an audience of hungry, active users that are ready to act, and yet you plug out one templated E-Mail promoting your product after another. Sit back and think about why the recipient would take action. Is it a question you provide a ‘must-know’ answer to? Is it an ‘act-now’ (and now only) deal? Is it a unique gamified experience? Is it triggering intrigue, or a feeling of exclusivity, that causes actions? Send less. Think more. 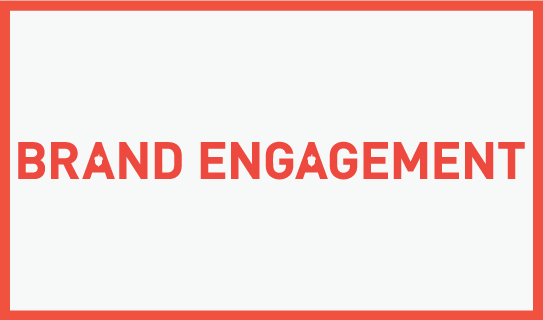 Gain real engagement. Take a step back from your analytics tools, grab a few fellow team members, a conference room, and a highlighter and take over the good old whiteboard. Your ROI will soar and your brand will thank you for not being a spam brand, but an engaging brand. Let’s thank a bunch of acorns and emojis for that. *Side note to that acorns hunt E-Mail example: Getting a $20 gift card for a minimum $100 order, so a 20% Off Your Next Order ‘gift’ is a rather sad incentive (why not truly give $20 gift cards?) that can quickly turn potential fan excitement to immediate bummer brand reclusive. I noticed that after my hunt was over. I happened to desire a cold beverage on the very night of the infamous Fernet-Branca Coin Release Party and the ones in line were all bartenders ‘in the know.’ I spent the remaining evening reading up about this phenomenon; over a cold, home made, cocktail. Fernet-Branca, the brand of the bitter herbal liqueur that falls into the amaro family of spirits (it tastes indeed a little bit like a sophisticated version of Jägermeister), revisited the tradition of the ‘challenge coin,’ made popular by the armed forces, but later adopted by law enforcement and the trades. Basically, any group of hard working people that like to drink. So, yes, there are many groups that created their own coins. The rather simple rule of the game: You have a coin, you are in the club and you are safe. You don’t, you pay a round of shots. 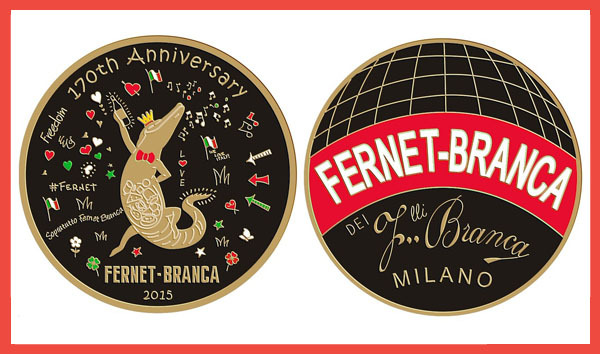 Fernet took that idea and started creating their own coins, customized to cities or events where they are released in numbers as low as 100 to a group of bartenders, or others in the know. Instead of making it a silly sales promo by randomly handing it out to customers, Fernet understood the power of their facilitators, their real sales crew: the bartenders. The coins of Fernet come with a few more rules, says Kirsten Amann, the Boston ambassador of Fernet (in an Eater article): “You have to have it on you at all times. You must be able to produce it in less than 4 steps. You’re not supposed to give it away or lose it. The only person who can replace it is the person who gave it to you.” Needless to say, the Fernet-Branca coins are rare. Very rare. You can fetch them on eBay for $150-$350 a pop. That would be a great tip for any bartender, but they rather keep them on hand than take your money for it. And this explains a line around a phone booth on a Sunday night. Fernet releases these coins to their influencers and thereby formulates a secret handshake amongst the few. Drop a Fernet-Branca coin at a bar in a foreign city and you will gain immediate friendship, honor, belonging, and likely a free shot. Fernet successfully understood the importance of the bartender’s role as an influencer and how their brand perception of Fernet will spread hundredfold to new customers who want a piece of the story, the intrigue and the idea that they, too, are in the know about a strange bitter liquor from Italy that most have not heard of, or haven’t had the guts to order. Creating a ‘club’ of salespeople that are not employed by your brand is a genius move. Empowering them with a free viral campaign that keeps on spreading, is beyond genius. Let’s take a fresh look at your brand: who really are the direct influencers? Most of the time they are the ones facilitating the sale, and most of the time they are the ones that are the least equipped to share the tales of a fascinating and captivating brand aura. Now that we realized, once again, that long-term allure (branding) sells more than a ‘salesy’ product push, let’s equip your direct influencers with your version of the coin. It will likely not be a physical coin, nor a shot of Fernet, but it should start with your ‘secret handshake’ and end with a toast to common ground.